We have not been having success with our hives. For the last two years we have lost hives. Colony Collapse? We don't know, but we have missed having honey. Tim has really put together something special. Here you see the hive body, with room for 8 tall frames. On one side you see the PVC pipe where bees will come and go. On the other side there is a place to put the mason jar that you would use to feed the bees sugar water. Here Tim and the Farmer discuss the hive body at length. The pressing question? How do we get the bees in there? Nope, Tim had it all planned out. We took the body over to the the local Bee folks where we had ordered a package, complete with a queen. 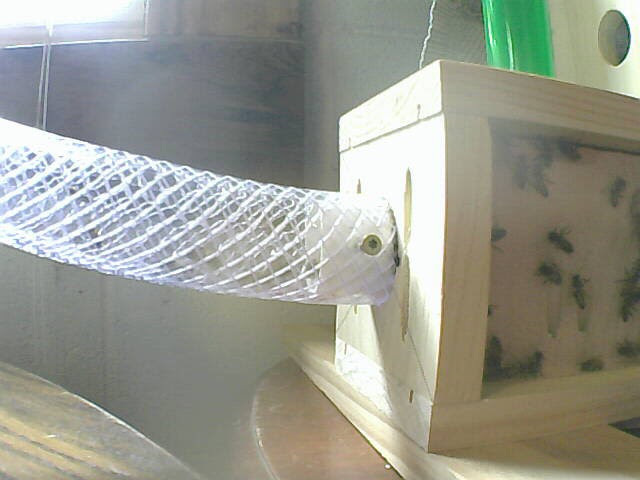 We left the hive body there overnight, so they could wait for all the bees to come back to the hive for the night. We went and picked up the whole shebang the next day. Here we are on the lower deck, and the Farmer is all decked out in his bee suit. The funny looking frame on top is a flow frame. The way it works is that there is a crank on the side, and once the bees have filled that frame with honey, us humans can turn the crank and harvest the honey without opening the hive and disturbing the bees. But don't worry, there will be plenty of honey in the other frames for the bees! The hive in place in the basement. Here we see the hive in place in the basement. Below you can see the tube that the bees travel back and forth in.